While Mayor Pike’s announcement in oppositionto the proposed coal export terminal in Whatcom County is an important step in getting public officials to publicly oppose coal export from GPT, there is more work to be done in the area of local and national politics. Take for example, Senator Patty Murray’s S. 942 Transportation Infrastructure Grants and Economic Reinvestment Act. Please take the time to read it closely, but in summary it is an all-purpose transportation infrastructure bill with a big bucket of money that could finance such things as the GPT piers, associated rail and road construction, and wetland mitigation. Oh…paid for by taxpayers should also be mentioned. There is no exclusion of coal export terminals in the bill either. However, it does exclude the “cost of dredging activities (3b),” which seems to make this bill tailor-maid for GPT. A trojan horse, as one person put it. At this stage, SGSF is interested in collecting as much information as we can about this bill. Please email us with your thoughts, comments, insights, and research. We will follow-up this post with a recommended course of action. Until then, we’ll leave you with a bit of public information that we think may be relevant to understanding this process. In a 2009 Public Financial Disclosure Report for Patty Murray, her husband, Rob Murray’s, retirement account with SSA Marine is valued between $250 & $500K. Yes…SSA Marine, the largest marine operator in the world that wants to build a the largest coal export terminal in the country in Whatcom County. It was great seeing everyone gathered for the McKibbon event tonight, committed to standing up for what we believe is right and doing our part to stop coal exports from Cherry Point (and beyond). Thank you to REsources for hosting the event. We’d like to share a video with you that is put out by Freight Rail Work to promote Railroads and Coal as a Unique Partnership. While this is intended to be a promotional video, you may feel otherwise. We’d love to hear your thoughts, because we certainly have our opinion. Also, a reminder that Mayor Pike of Bellingham will hold a listening session regarding the coal terminal at 6pm on Wed, June 1 in the large courtroom in Municipal Court. Early next week we will begin much more regular posts to this blog with the intention of sharing a scope of materials that we find to be particularly interesting and relevant to the proposed GP Terminal at Cherry Point. Some of these posts will elaborate on the “Dirty Trail” tidbits we shared on our banner tonight, as well as other bits of information such as the video shared above. We will also continue updates on action items. Please consider subscribing to our blog in the right column so that you are notified when updates are made to the site. In addition, our listserv is conservatively used for announcing events and working group meetings. Writing Letters: The "Inland" Route? Due to technicalities wherein county government might find itself in a quasi-judicial status sooner than we think, we need concerned citizens to share their opinions with two media outlets immediately: the Whatcom County Council and Executive Pete Kremen. Once they have a permit for the Gateway Pacific Terminal [GPT] in hand they have a quasi-judicial status and cannot receive any input from the public. This means we have to get letters in right away. Tell everyone you know to write! write! write! now! While they are still allowed to listen! Our affiliate, RESources has a useful fact sheet available. Additionally, SGSF is in the process of developing a similar list of county impacts, so please email and send us any information you regard as worthwhile. Don’t be bashful about writing to Bellingham Mayor, Dan Pike, who has done his best to tacitly support the coal terminal while simultaneously steering the coal train and its unnecessary impacts onto Skagit and Foothills folk! His so called “inland route” conjures up some desolate void out in the middle of nowhere … “away from population centers.” In actuality, his comment foists these mile and a half long monstrosities on the many population centers of Mt. Vernon, Burlington, Sedro Woolley, Acme, Deming, Nooksack, Lynden, Sumas, and Blaine. Thank you NOT Mr. Mayor. Truth be told, intricate interstate commerce legislation allows railroads, such as the Burlington Northern Santa Fe [BNSF], tremendous leeway to do what is in their most profitable interest and if GPT gets permitted the train will eventually be looping around the entire county. Choose your targets friends and neighbors: GPT or BNSF. Which reminds me! 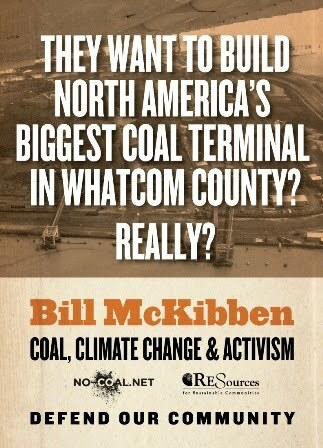 There is an online petition available urging elected officials to support No Coal to China for Northwest Ports.